2017-01-01 — Joe's B.S. has closed after fifty-one years of operation. 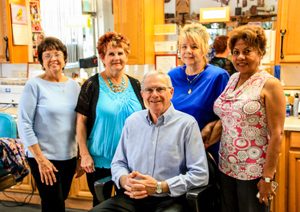 Ross Nichelson, now retired, sincerely thanks all of his customers for their business and loyalty over the years. Thank you! The History of Joe's B.S. The following history was originally published when this website premiered in May 2013. It is now presented here, with an additional brief section on our closure, as a tribute to the shop and its legacy. Joe's B.S. has been around long enough to see Orlando change from a quiet, citrus-based community to a bustling metropolitan area now known around the world for its tourism industry. We too have changed and grown over the past fifty-one years. This is our history. Our story begins in early 1962 with Joseph "Joe" Fallucca (1924 – 1987) and his honorable discharge from the U.S. Navy. 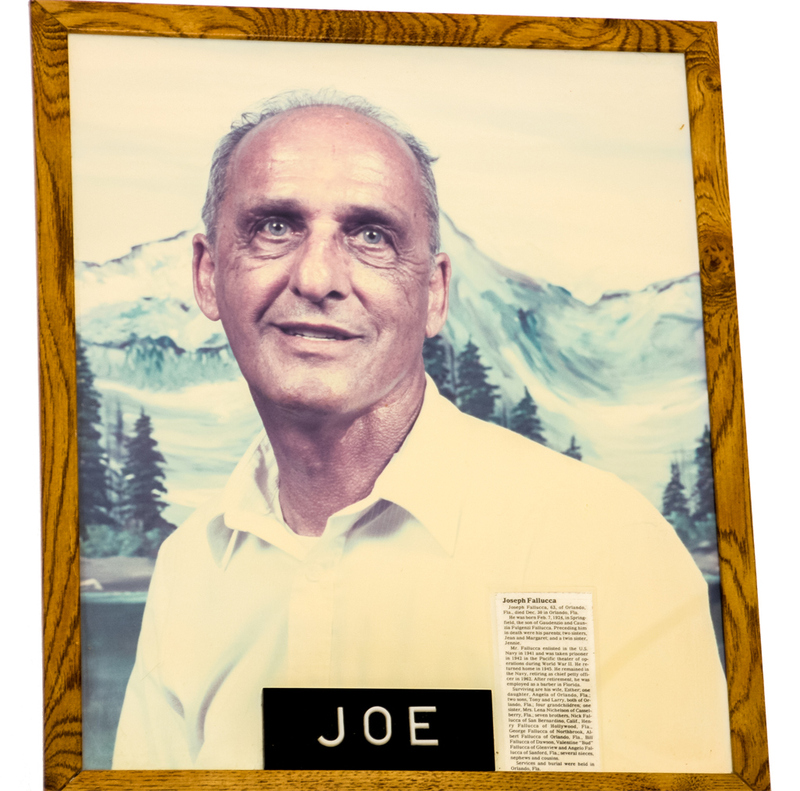 A World War II veteran and former prisoner of war returning from a final posting in Italy, Joe decided to move to Orlando and take up barbering for his post-Navy career. Joe met up with business partner H. Kenneth "Ken" Jennings (1911 – 1992) and started cutting hair at Ken's Barber Shop on Edgewater Drive at Dowd Avenue. 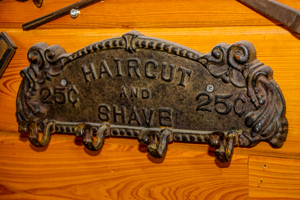 They provided what most today would consider classic or old-fashioned barbering service but at the time was the norm. Joe's old friends who came in, many of whom were veterans themselves, were partial to flattops necessitating that he learn to do them well and quickly. As early as 1960, there were plans to widen Edgewater Drive from one lane in each direction to two. The project moved forward, right-of-way acquisition plans materialized and the Orange County Zoning Board started issuing recommendations to property owners. As a result, Ken and Joe found themselves needing to relocate; they did so in 1965. At the same time, Ken was becoming more interested in his hobby, a fifty-acre orange grove on Clarcona-Ocoee Road just east of where Clark Road is today. He decided to tell Joe, "you take over the shop now and I will work for you." When the shop reopened at 975 West Fairbanks Avenue — in the nearby Fairbanks Shopping Center built in 1954 — it did so with Joe's B.S. on the sign. Working together over the next years, Joe and Ken would continue to serve as neighborhood barbers for an ever-growing and changing community. By 1983 though, Ken retired from barbering to spend time with his family and orange grove full-time. He and Joe had worked together as partners for over twenty years and were still good friends, a very rare occurrence in the business world. Either of his own accord or spurred by Ken's departure, Joe decided that he too was just about ready for retirement. Joe's nephew, Ross Nichelson, had been living in Pennsylvania for many years when he was laid off from his job in early 1984. He was interested in relocating to Central Florida for better employment options, warmer weather and to be closer to his many relatives that settled there. Ross' mother Lena, a resident of Casselberry at the time, was mailing him employment listings from the Sunday newspaper every week. Time was passing but nothing suitable had presented itself. One evening, Lena telephoned Ross to ask a question. "What do you think about barbering," she asked. Ross had not really considered it before, but Lena explained that Uncle Joe wanted to retire. Should Ross be interested in barbering, Joe was willing to keep the shop open while Ross moved, attended barber school and obtained a license. He would then continue on in the shop, ideally working two days per week — more if Ross needed guidance, less if he did not — until retirement. Figuring that he would not receive a better offer, Ross decided to accept and like his Uncle Joe before him, move to Orlando to start a new career in barbering. One day in 1986, Ross walked into the shop to show Joe his newly issued barber license. After looking at the license, Joe handed Ross a set of keys. "There you go, Ross," Joe said. "You're in business now, you pay the bills." Ross started working side-by-side with Joe, putting his new skills into practice and enjoying the chance to hear Joe tell his life stories. Two weeks later, Joe told Ross that he was taking a trip to Italy. "I'll be gone six or twelve weeks," Joe said. "I'll let you know how long when I get back." Before he left, Joe paid the rent, electricity and water bills three months in advance. His parting advice for Ross was typically Joe. "All you have to do is show up and put the key in the door every day," he said. Joe would go on to Italy and other destinations, spending time with family and friends. Joe enjoyed his retirement with the same gusto and appreciation for living that he had during his working days, including a proclivity for conversation and storytelling. "Joe was one of the most fun-loving people I've ever known," Ross recollects fondly. "Every day was a party, a celebration of life." "And if you knew him," Ross continues, "you'd understand what that 'BS' on the shop's sign really stood for." Unfortunately, after only about one and a half years of retirement, Joe would succumb to cancer on Wednesday, December 30, 1987. He was survived by his wife Ester; sons Tony and Larry; daughter Angela; brothers Nick, George, Bud, Bill, Angelo, Albert and Henry; sister Lena; three grandchildren; and a stepgranddaughter. Ross continued cutting hair and giving speedy and quality flattops. The sign out front never changed as a tribute to Joe, whose photograph is proudly displayed on the shop's wall. 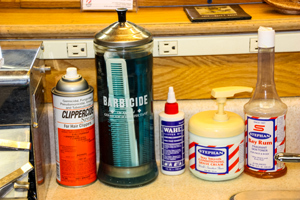 Many of Joe's former customers continued to come in for flattops and the traditional service offered, service that many places phased out or never had. Not to mention, it can be hard to find a barber that you like with a talent for flattops. Because there is no margin for error, "flattops are the most difficult to learn how to do," says Ross. "If you make a mistake, you can't hide it." 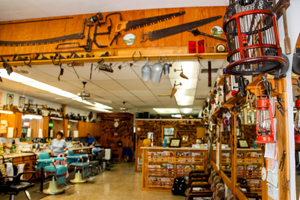 Contributing his own personal touch to the shop, Ross built upon the established themes of traditionalism and appreciation for the past by keeping televisions out of the shop and hanging a number of vintage tools on the wall. 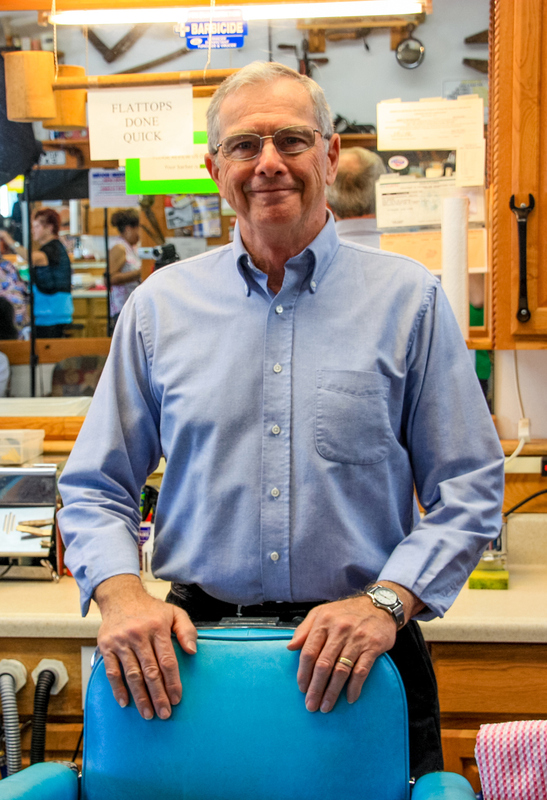 A woodworking hobbyist — or professional, depending on who you ask — Ross has always enjoyed working with his hands. From the whittled wooden statuettes and caricature heads adorning the shelves to the shop's cabinetry and clipper vacuum system, Ross' additions were frequently as functional as they were creative or aesthetic. Due in part to the contributions of regular customers, an antique tool museum of sorts started to form complete with a few uncommon artifacts. Before too long, there was an oversized wooden mallet (for "flattops done quick"); large and small saws; whittling implements; hand-powered drill presses; spirit levels; block, jack and smoothing planes; vintage nautical navigation lights; an early 1900s Fire-Gun extinguisher; and a metal bird cage, home to a miniature bottle of Wild Turkey straight bourbon whiskey. As the final decade of the twentieth century got underway, two now familiar faces walked into Joe's B.S. and assumed their place in shop history. Joining Ross at the other two barber chairs, Ruth Wells came aboard in 1993 followed by Judy Curtis in 1994. Both women would barber and build a clientele at Joe's B.S. during the subsequent years; like Ross, Curtis continues to serve the community with us today. To expand the range of services rendered and provide chairs for additional hairdressers, Joe's B.S. moved two doors down from 975 to 979 into Ginger Taylor's existing Totally Clipz salon in 2006. It took a little time but the wood carvings, amusing signs, tools and antiques would slowly reappear to decorate the new space, bringing to it part of the old shop's charm and ambiance. More recently, we were pleased to welcome Gladys Tello to the team in 2013. Beyond the contribution of her skills and professionalism, Gladys' bilingualism also allows us to reach out better to our friends in the Spanish-speaking community. On Sunday, May 5, 2013, Joe's B.S. premiered a new website designed, created and written by David July with photographs by Carol Nichelson. In addition to providing information on the shop's location, services and personnel, the website also features this comprehensive history to share with others the fascinating story of Joe's B.S. They may have waned in popularity since the 1950s but flattops, like many other cultural expressions, make comebacks. Today, they account for about twenty percent of our business and just like in Ken and Joe's day, we do flattops like they are supposed to be done. Some people come in and wait for their regular barber, the one who remembers exactly how they like their haircut each time, while others are content to take the first available chair. Regardless of your preference, our barbers and stylists make sure that you walk back out into the world completely satisfied with your look and feel. 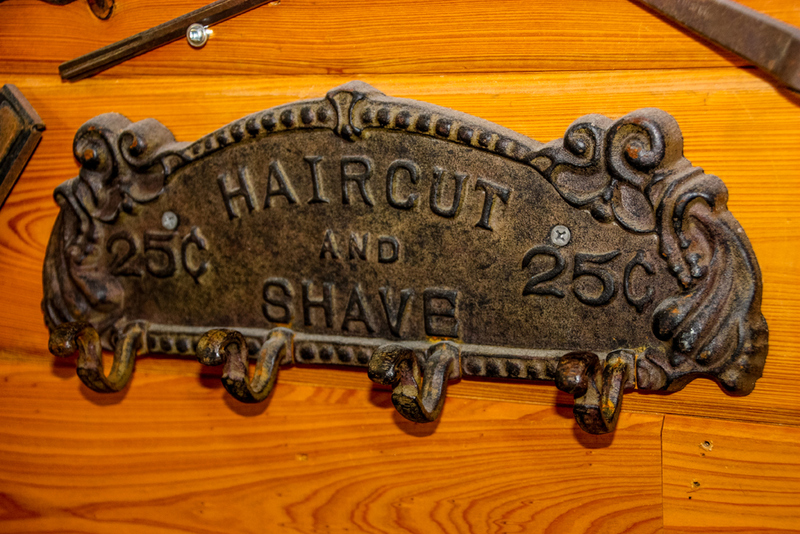 Whether you want a flattop, appreciate the old-fashioned service like the straight razor shave around the ears and the back of the neck included with every haircut, or simply wish to take in the nostalgia, we look forward to serving you and the entire family at Joe's B.S., your neighborhood barbershop. Joe's B.S. permanently closed after fifty-one years of operation as of Sunday, January 1, 2017. 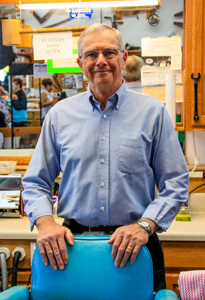 Ross Nichelson, now retired, sincerely thanks all of his customers for their business and loyalty over the years. On Thursday, January 16, 2003, the Orlando Sentinel published an article featuring Joe's B.S. 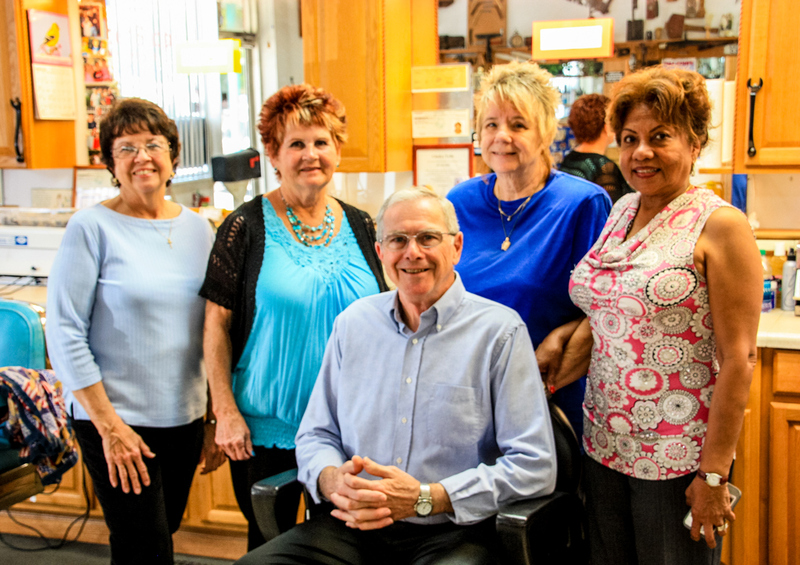 and barbers Ross Nichelson, Judy Curtis and Ruth Wells. Although we have been able to research and clarify some of our history since then, the commentary piece by Jim Toner is a quick read that excellently captures the shop's special nature. As a teenager in the '50s, I once wore a hairstyle that was considered pretty stylish despite Elvis Presley's ducktails. It was called the flattop. And I was pretty particular about it, too. A flattop should be flat. Right? Once, when I kept demanding that a barber take a little off one side, then the other for balance, he became exasperated. "Look, kid," he explained. "It's not easy to give a watermelon head a flattop." That's about when I started wearing my hair like James Dean. Most girls missed the connection, though. But the sharp-tongued barber was apparently right about challenges posed by the flattop. 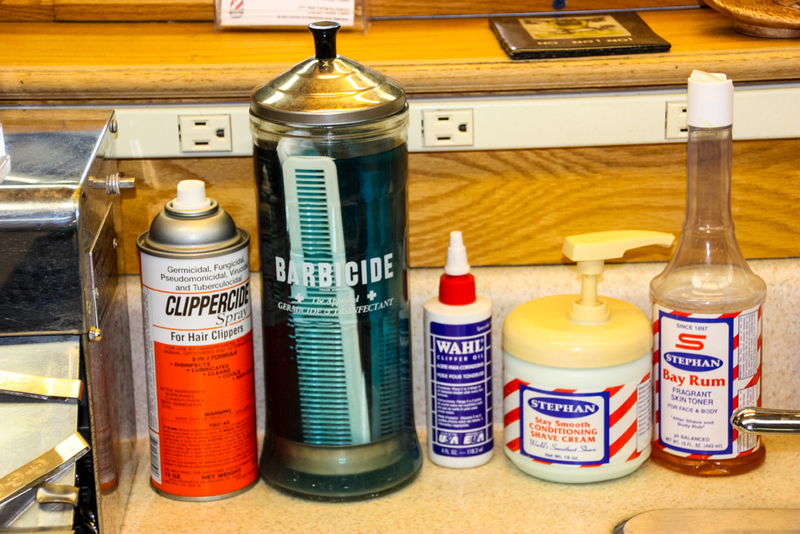 "Flattops are the most difficult to learn how to do," said Ross Nichelson, who runs an Orlando barbershop that has been in the family for almost a half-century. "If you make a mistake, you can't hide it." 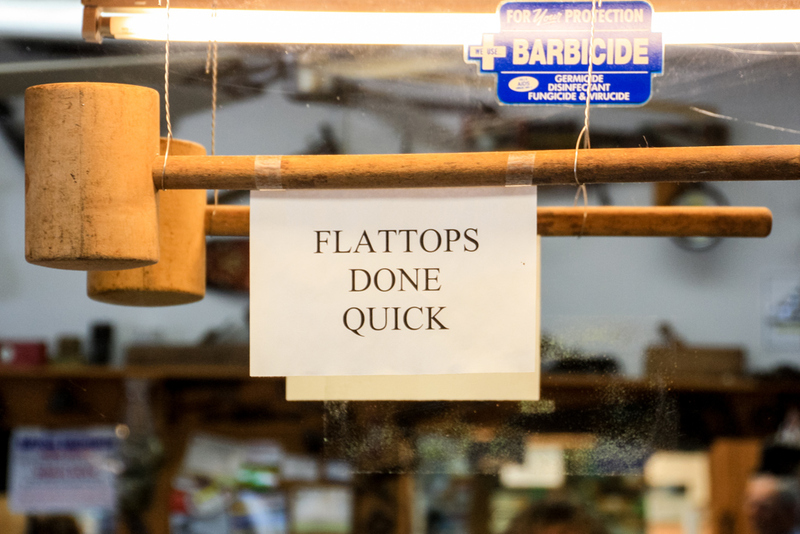 While watermelon heads are easy to spot, another barber in Nichelson's shop, Judy Curtis, says there are perils when giving a flattop to an unfamiliar customer with a head full of hair. You know, those people who, as Curtis puts it, "look like refugees from the '70s." It's that little knob on the crown of the head. It's not so little on some people. When they get a flattop, that knob sticks out like Mount Rainier. This is important, because the flattop is back. So are other short cuts. Nichelson says they account for 40 percent to 50 percent of his business. They ought to. There's a banner draped outside the shop, on Fairbanks Avenue, proclaiming "Flat Tops are our specialty." The shop is called Joe's B.S., named after Nichelson's uncle, Joe Fallucca. No one is sure when Joe first opened his shop. They just know he moved it to the Fairbanks location just off Edgewater Drive in the '60s. He had to move. When Edgewater was widened to four lanes, they took out his old building at Dowd Avenue. Nichelson learned barbering and joined his uncle in 1985. His uncle died a year later but had pretty much turned over the business to him. Nichelson said his uncle, a World War II veteran and former prisoner of war, had so many of his old buddies come in that he had to learn how to do a flattop fast. He also added some touches to the shop. He always loved working with his hands. So he hung some vintage tools on the wall. Those wall displays grew as his customers contributed to the interior decoration. Now, the place looks like a tool museum, with things like an old drill press operated by a hand crank. A large wooden mallet also hangs there for "quick" flattops. The presence of those contributed tools almost gives his customers a piece of the place. Besides Nichelson and Curtis, Ruth Wells cuts hair at Joe's. Curtis and Wells have been there for years. All give flattops. Some customers have their favorite barber; others just grab the first open chair. It is truly a neighborhood barbershop. "Cows may come and go but in this place bull goes on forever." Jim Toner can be reached at jtoner@orlandosentinel.com or (407) 772-8034. Copyright © 2003, Orlando Sentinel.